About The Artist: Copper Tom is unique in the ever burgeoning field of children’s music in that he incorporates cool, sometimes arcane, rhythms into cool, accessible songs. 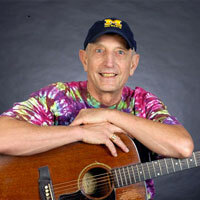 He draws inspiration from American roots music including old time country, blues & roots rock & roll. He might throw in a little New Orleans funk, some Trinidadian calypso, a little reggae &, some deceptively simple tales ( or in the case of his doggie songs- that would be “tails”) &….well, you get the picture! Then again, only by listening will you really start to appreciate what his unique musical vision has to offer! Albums: Get The Beat!, Jump Around!